The What: QSC will introduce its AV-to-USB Bridging solution, which includes the Q-SYS I/O-USB Bridge and two PTZ-IP Conferencing cameras: the Q-SYS PTZ-12X72 and Q-SYS PTZ-20X60. The What Else: The new Q-SYS PTZ-IP Cameras and Q-SYS I/O-USB Bridge are designed to solve the problem of the meeting room geography when integrating soft codec conferencing with camera feeds and audio by introducing IP-based cameras and USB bridge into the Q-SYS platform. 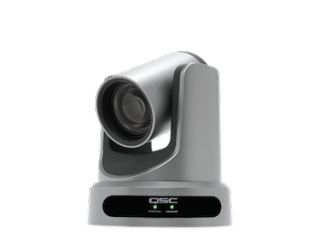 The Q-SYS AV–to-USB Bridging solution uses driverless USB 2.0 for webcam video emulation and AEC speakerphone audio. This means no additional software or drivers are required to make the solution work with modern PC operating systems and soft codec applications such as Skype for Business, ClickMeeting, Adobe Connect, GotoMeeting, WebEx, and others. This combined solution will integrate with all current and future shipping Q-SYS Cores such as the Core 110f and Q-SYS peripherals. This means that existing Q-SYS conference systems can add camera video to their arsenal of AEC, third-party integration, and control. The Bottom Line: The Q-SYS I/O-USB Bridge and Q-SYS PTZ-IP Cameras will be demonstrated in a soft-codec enabled boardroom at Booth #C10507 during InfoComm 2016. Visitors can also receive an in-depth explanation of QSC’s new USB-to-AV Bridging solution at the InfoComm Manufacturer Training on June 8, 2016 at 3:30pm in Room N233.